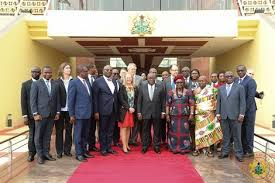 Government says the arrival of ExxonMobil in Ghana’s oil and gas exploration space should send a signal to potential investors around the world that Ghana is now open for business and has exciting commercial opportunities in a secure maritime environment. He said ExxonMobil decided to invest in exploration activities offshore Ghana after the final ruling of the International Tribunal for the Law of the Sea (ITLOS), which went in favour of Ghana. Ghanaian ownership is estimated at 30 percent. Mr Agyarko revealed that exploration activities, including acquisition of seismic data and analysis, are expected to commence later this year. The Deepwater Cape Three Points (DWCTP) block, located 57 miles (92 kilometres) off the coast of Ghana, measures approximately 366,000 acres (1,482 square kilometers) in water depths ranging from 5,085 feet to 9,350 feet (1,550 meters to 2,850 meters). Dr K.K. Sarpong, Chief Executive Officer (CEO) of GNPC, in a remark, said the two key innovations to the agreement were the Development Lon Agreement and the Default Loan Agreement. Such innovations, he added, were aimed at securing GNPC’s financing arrangements during the development to give comfort to the contractor party. ExxonMobil will carry out the work programme as operator, and holds 80 percent interest. GNPC holds 15 percent interest. ExxonMobil will work with Government to identify a Ghanaian company to potentially hold up to 5 percent interest. After this indigenous company signs the agreement, it would proceed to Parliament for endorsement followed by its immediate implementation.